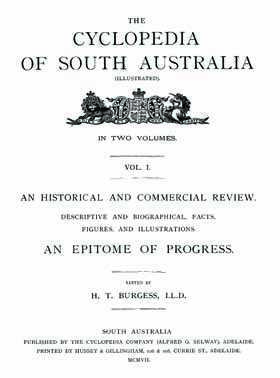 The Cyclopedia of South Australia (1907-1909 H. Burgess) were published for most states of Australia around the beginning of the 20th Century are a vast resource of historical and biographical information on the state concerned - the people, towns, industries, professional, commercial and social institutions and much more. They include thousands of illustrations, the larger number of these being portraits of those whose biographies are included. These are not just the rich and famous, but include a high percentage of the ordinary citizens in each community. Local government - Adelaide, Port Adelaide and various suburban councils and suburban "districts"